Q – Roughly 10 years ago you lived through a horrific motorcycle accident where you sustained breaks to both of your femurs, hip, pelvis tibula and fibula. During your 5-1/2 months in the hospital you worried about your three children, lost your job in a corporate restructuring, went through a marital divorce and lost your beloved dog. Yet you didn’t let anything stop you. You picked yourself up, got on your laptop and worked toward an online certificate in coaching. You always maintained a positive outlook. Was this certificate your dream before the accident? No Fran, coaching wasn’t even a career that I had even heard of although unbeknownst to me, I have always done it. I had wanted to become a Spiritual Psychotherapist but after seeing one, she convinced me that Coaching was the NEW Career path I needed to take, so I took her advice. It certainly “FIT” felt like I was home. The average person would be depressed from what you went through. Yet you turned your negative into a positive. Not everyone is able to get over their heartbreaks as you have done. What is your secret? Let’s rephrase that Fran , shall we? I think that EVERY ONE has the capability of overcoming much more than they think they can, but until we are put to the test, none of us really know our limits. I have always been an optimist, and a dreamer and somehow have always had the confidence in my ability to create whatever I vision. Perhaps what others are lacking is just the skill set and role models I have been fortunate to have had in my life. Specifically my father. He is a survivor and that is something I suppose I get from him but also something I really admire in him. In fact, I have just started a new Radio show titled Crazy Good Radio that I call a Negative Intervention. It is all Positive News, Guests, stories, music..etc. I want to show listeners HOW to pay Positive Attention and have a Positive Intention. It means you will have to look at the world in a different way, through a different lense. Being Positive is a CHOICE that I make. It is a disservice to waste ANY of the amazing time we have here on Earth wallowing in self pity or negativity. We can do that later when we are dead. ( but we won’t). You state that your past is not your potential for potential has no bounds. “Choose to break from your self-imposed limits,” you urge. “Use your imagination to create a life of Endless possibility.” Well, for some of us without imagination and self-imposed limits it’s harder to do. What do you suggest? Great Question. When you cannot ‘vision’ your way to a new or different lifestyle or situation, that is when you hire need to hire an expert like a Coach. Life Coach’s don’t tell people what to do or how to live their lives. What they DO offer is really GREAT questions that will help an individual remember and or/ reframe what they really want in their life. How they want to live and how to get there. Sometimes all we need is someone to listen to us, Champion us, dream with us and keep pushing us to the other side. Most of us live with self imposed limits. Society has set us up that way. We are socialized to act and think in a certain way from the time we are born. Either we are good little girls and boys or we are bad. Children who are often told NO, they aren’t good at something (whether right or wrong) find that those labels go deep into their subconscious, affecting their self esteem and self image. Family, Teachers, Friends and Lovers all have had their influence on us. The good news is that we can change and repair any damage starting with acknowledging that is what you want to do. The Chinese have two characters for Change. One is Danger , the other Opportunity. I love this because it is so true. We cannot have the wonderful things we want without leaving our comfort zone, IE The DANGER. But if we do, we get the REWARD- Opportunity. We always have a choice. When fear faces you, you can either run – or take take action! EFT (Emotional Freedom Techniques) reverses fear, including procrastination, which is always fear based. It seems easy sometimes, to do nothing or something else. When that happens, try visualizing the positive action result. Try tapping (EFT). If you’re still not convinced it’s time to move, then perhaps “it” need to be tossed. It’s you’re choice; listen to your intuition ’cause you’re (almost) always right! Want to learn and succeed with EFT? A few video skype sessions does it! You can find out more about EFT https://t.co/Mx3LRbZmDR and many more success tips&strategies! You always have a choice even though you may not realize it in the moment. Circumstances may be beyond your control; your attitude is your choice. Going to the places that scare you, being fearless and choosing to be resilient, that’s what this blog is about. I became fearless going on the “scary” rides in Coney Island, Brooklyn as a child even though I never would go on the parachute- there were known accidents on that one and I was very safety conscious- Mom was a worrier. Walking on hot coals while on a mind body spirit retreat in Santa Fe ( first time away from my young children too). We had lots of prep time and when it was my turn I was ready. Awesome. Forty years ago: Steve & I rode our bikes out of Florence (where we bought the racers- and mine was a boy’s with the bar- the only kind made at the time) and I scared myself with a coughing attack that precipitated me throwing the pack(s) of Marlboros out- which was scary ‘cause I couldn’t imagine not smoking “cold turkey” which I succeeded at. And it was difficult- maybe not scary- to totally change our travel plans so that we went back to the city and got the bikes on trains that rode out of the seven hills, through the Alps and landed us in Germany to enjoy the rolling hills (so we could use all the gears ) and along the Rhine onto Holland. Of course we stopped to eat and sleep in foreign lands- sometimes in hostels and sometimes in the forest, scary and amazing. When things get scary look straight ahead and focus. Be in the moment as much as times permit. Be Present. Be Happy. Have you ever tried a “personal mantra” or “positive trigger phrase” when things aren’t going your way? When you feel yourself slipping into a negative zone you can say “I choose to be happy” and focus on what that brings up in order to transition to a positive mind set. Challenging times can be difficult and negative thought patterns may be long ingrained. This can be changed by choosing to be happy and focusing on abundance and joy. It takes at least 21 days to create new habits-patterns. We can choose to retrain our minds to think positively even as we experience setbacks and challenges and in doing so empower ourselves with the ability to see the bright side of most situations. And the positive cycle continues and perpetuates itself as we begin to attract more of what we want and positive people into our lives. Finding the balance of spontaneity with intuition helps us make choices that benefit our lives. Notice when you are feeling impulsive or spontaneous and then ask yourself, “Will this really benefit me?” The answer comes in the form of a verbal response or simply an instinctual feeling. Try to pay attention to your feeling; that is your intuition guiding you to make the right choices. It is important to remember that making spontaneous decisions doesn’t necessarily mean being hasty. Acting with energy and spontaneity is a wonderful way to live our lives, as it means we are being in the moment. However, it can lead us to make decisions that may not be the best for us and may lead to stress, frustration, anger, anxiety, depression. I know my that SOAR! 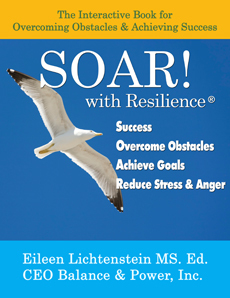 with Resilience™ Book can help with these issues and challenges. A must read for anyone struggling to take their personal or professional life to a higher level of success and satisfaction.